A couple of months ago, I started volunteering. I help out at a mom’s group by watching (with 2 or 3 other helpers) a sizable group of 2 and 3 year olds. It was a little to unstructured for my librarian brain, so I started doing a little programming. Each meeting we start off with a storytime. The first try didn’t go so well. I think at one point we had 7 criers and only two volunteers. This past week we had all our volunteers and storytime went much better. Thank goodness! I was inspired by a new penguin that Rico got for Christmas. His collection of stuffed animal penguins really came in handy, but more on that later. While the kids straggled in, I had a penguin coloring sheet for them. That way I didn’t have parents and new arrivals pulling on my listeners’ very fragile attention span. When everyone had arrived we moved to the story blanket and I started the storytime off with the song “Open Them, Shut Them.” I had taught this to the kids a while ago. One or two of them followed along. I am hoping after a couple sessions that they will pick-up all the actions. Our first book was “Penguin Pete” by Marcus Pfister. The book is a little long for the age group I was working with so there was a little edit in our story. Penguin Pete spends sometime alone, when the other penguins go swimming. He makes a friend and eventually gets to go explore the water with the other penguins. Pete is a small penguin. So, as I read this story I held one of Rico’s smallest penguins. As I put the little penguin away, I got out six more of his stuffed penguins (he has quite a few) and lined them up for the rhyme we did next. As each penguin left, I moved one of the stuffed penguins back into my bag. The kids really enjoyed the rhyme so we did it a second time and as each penguin left, I handed it to a child. The kids held them for the rest of the storytime, switching every once and a while so everyone got a chance to hold a penguin. So, will all the penguins doled out, we went back to the books. I read/sang “Your Personal Penguin” by Sandra Boynton. There is a great song that goes with the book. You can find it here. Warning: it is oddly catchy. My family is still singing it. I didn’t use the song because it doesn’t follow the book exactly…I decided to just stick with the book. We read a “Penguin” by Polly Dunbar next. This might be my favorite penguin book ever. It is about a boy named Ben and his pet penguin that won’t speak to him. Ben tries everything to get him to talk, but nothing happens until Penguin has to rescue Ben from a lion. It sounds a bit serious, but it is really delightfully silly. 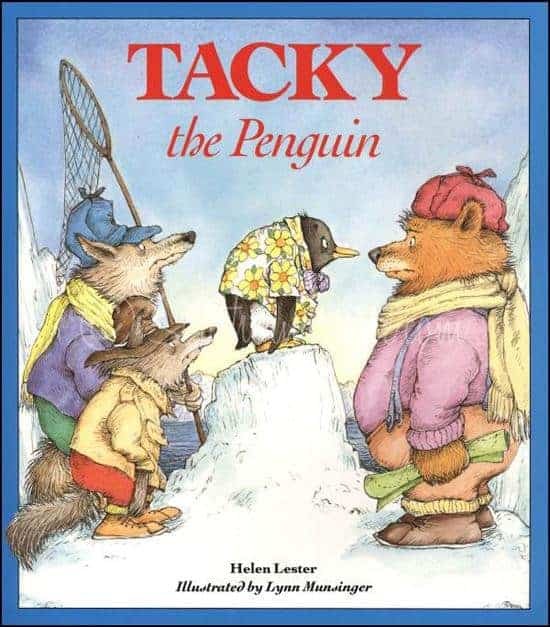 When everyone was seated and settled with their penguin, I read our last book: “Tacky the Penguin” by Helen Lester. Tacky isn’t like the other penguins, but when the hunters come, Tacky’s quirks might be just what the penguins need. This is a really fun read. The silly voices, and unusual antics kept most of the kids engaged. We finished the storytime off with “If You Are Happy and You Know It” and a gathering of all the stuffed penguins that had been passed around. The program was a bit long for my listeners. I’m hoping as I adjust my expectations to their attention spans, they will become used to the routine of storytime and enjoy starting off their play time this way. In case you are interestd, here some other great penguin books that I had in case one of my other books was a flop.